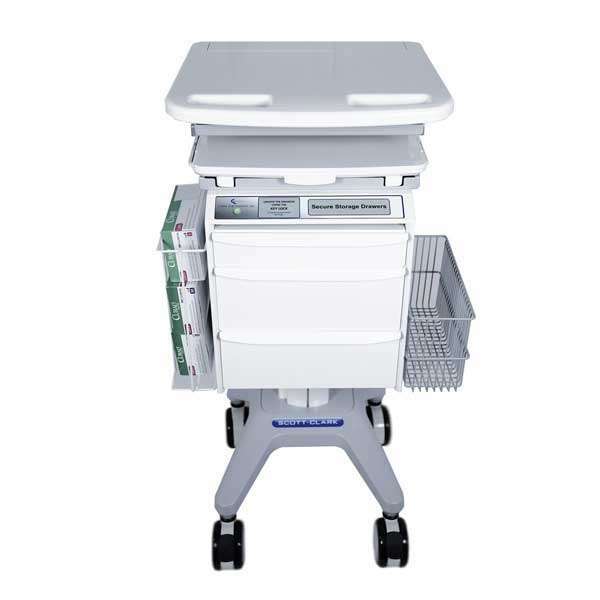 At Scott-Clark Medical we are committed to ensuring that your hospital mobile computer carts are functional and reliable for all your patient needs. A U.S. federal mandate stipulated that every healthcare facility with received Medicare funding must store patient information electronically. Consequently, a sharp increase in information systems in which this information is stored and accessed has emerged. Thanks to technology, a wealth of information is available and accessible from a medical cart for a computer. What types of information systems are used to contain this valuable information? A health information system (HIS) is a system designed to manage the data collected and stored in any healthcare facility. This includes doctors’ offices, private and public clinics as well as hospitals. These facilities collect, store, manage and send patients’ electronic medical records. The goal of using health information systems is to improve patient treatment by having the most current patient data available to every healthcare practitioner who treats this client. Obviously, this patient data is highly sensitive. Thus, any health information system used must ensure the accuracy of data collected and patient confidentiality. Other uses of patient data besides individual client treatment include medical research, policy-making data, and decision-making information. Health information systems routinely access, process, or store large volumes of sensitive patient data. As a result, security is crucial. Electronic medical records replace paper patient records. Several companies provide such information systems. Medical information on each patient must now be collected and stored electronically. These records would include patient health information, test results, doctor and specialist visits, healthcare treatments. Such information systems assist healthcare facilities and personnel with the management of daily operations of the facility. This would include things like scheduling of patients and medical services billing. Regardless of their size from single practice doctors to huge multi-center hospitals, all healthcare providers utilize practice management systems. The goal is to automate administrative tasks carried out as part of doing business in the facility. The software of this healthcare information system is aimed at connecting patient records more than one databases. The MPI contains records for any patient registered at a healthcare organization. MPI, as the name suggests, creates an index all the records for that patient. The intent of MPIs is to reduce duplicate patient records and avoid inaccurate patient information that could result in patient claim denials. This information system lets patients peruse their health data. They are able to access: appointment information, medications they may be receiving, and their lab results via the internet. Some of these patient portals also facilitate patients to have active communication with healthcare professionals including physicians, pharmacists regarding their prescription refill requests, and scheduling of appointments. This is also termed telehealth. RPM provides medical sensors that have the ability to transmit patient data to healthcare professionals who might very well be halfway around the world. RPM can monitor blood glucose levels and blood pressure. It is particularly helpful for patients with chronic conditions such as type 2 diabetes, hypertension, or cardiac disease. Data collected and transmitted via PRM can be used by a healthcare professional or a healthcare team to detect medical events such as stroke or heart attack that require immediate and aggressive medical intervention. Data collected may be used as part of a research project or health study. RPM is a life-saving system for patients in remote areas who cannot access face-to-face health care. CDS analyzes data from clinical and administrative systems. The aim is to assist healthcare providers in making informed clinical decisions. Data available can provide information to medical professions who are preparing diagnoses or predicting medical conditions like drug interactions and reactions. CDS tools filter information to assist healthcare professionals in caring for individual clients. 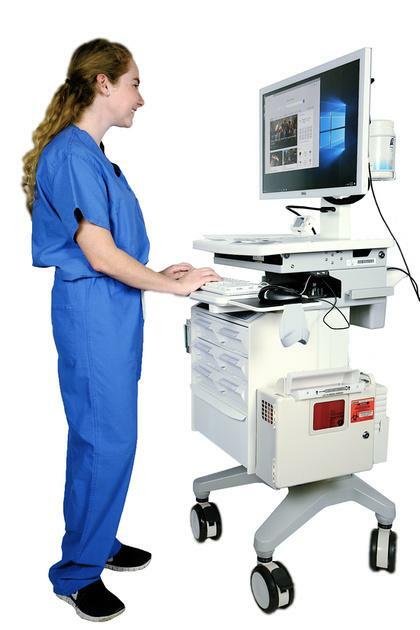 Scott-Clark Medical will assist medical facilities in ensuring that hospital mobile computer carts are equipped with the best information systems for making informed healthcare decisions that fit their patient needs.